Antiseptic, relaxing and uplifting. With its lovely warm, sweet and fruity aroma, Mandarin Essential Oil has a wide range of health benefits that can be put to great use on both mind and body. Mandarin is commonly used in body massage blends along with Rosehip Carrier Oil in the battle against cellulite and to help fade stretch marks and scars. 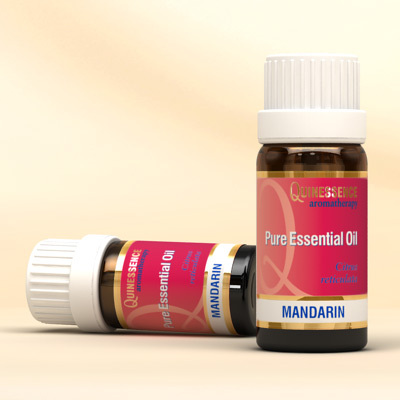 When vaporised, the delicious fruity aroma of Mandarin Essential Oil creates a soothing and relaxing atmosphere that calms the mind if you have trouble sleeping, and uplift the spirits making it ideal for negative emotional conditions such as stress, irritability, restlessness and tantrums - with both grown-ups and children! To create a really effective synergy for treating cellulite, blend Mandarin Essential Oil with Juniper Berry, Grapefruit and Cypress, and combine it with Frankincense or Neroli to reduce stretch marks or scars on the body. It is also has a toning action that can be used to revitalize dull skin and can be used as an effective antiseptic agent.